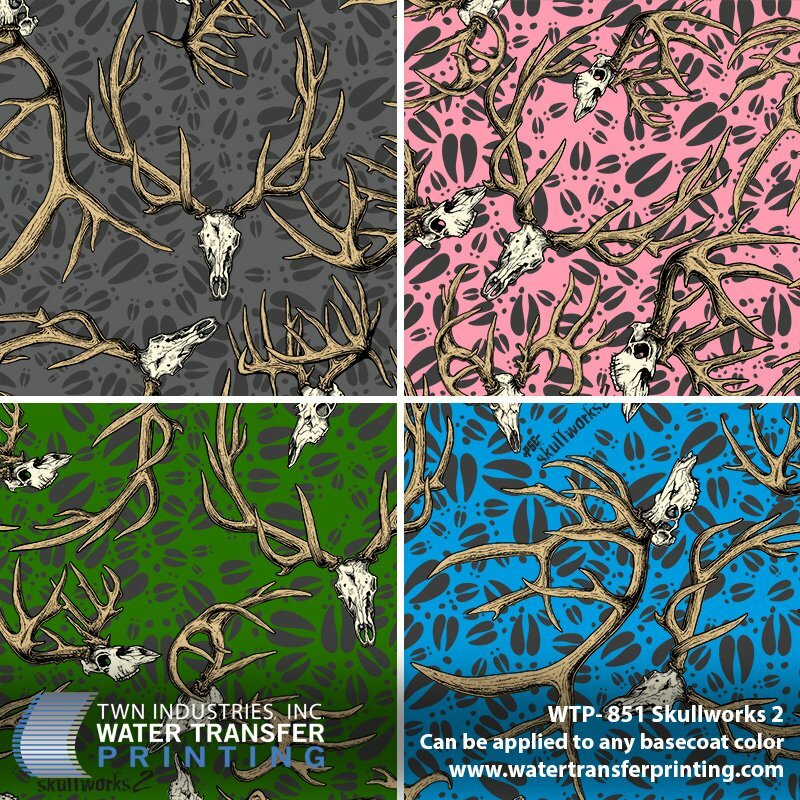 PRINCETON, FL – December 1, 2015 – TWN Industries Inc., the leading Water Transfer Printing supplier, has teamed up with PSE Archery for the release of their highly anticipated Skullworks 2 pattern. PSE Archery, a manufacturer of bows and accessories, had the Skullworks 2 Camo pattern specially designed for their products. However, while this pattern is exclusive to PSE Archery for their product category, the pattern is now available for purchase from TWN for non-competitive categories, including archery accessories and aftermarket decorating. Skullworks 2 is an entirely new look for the PSE Skullworks series. While the original version had deer and elk skulls that were designed to have a 3-D appearance, PSE has taken a new approach that seemingly takes a cue from the past and uses classic hand-drawn artist-created images. It’s these hand-drawn images that give the deer and elk an aggressive and trophy-like look, while creating a pattern with distinct depth and texture not found in many of today’s digital artwork. Additionally, the new version has a background layer of hoof marks that offset the deer and elk skulls, giving the pattern much more personality. The pattern will prove to be extremely versatile for hydro dipping processors because of the ability to use any basecoat color. This empowers processors to create unique designs with the pattern. Best of all, the pattern’s contrast and detail make it a good fit for bows and other hunting products. And since the pattern is printed on 60 cm film, it’s the perfect choice for smaller-profile parts. Additionally, the design itself is small enough to be distinguishable on a multitude of parts, including smaller archery-related accessories. “After the huge success we experienced with the first Skullworks pattern, we were happy to team up once again with a leader in the hydrographics industry like TWN industries. We’re confident that Skullworks 2 will be widely accepted and loved by outdoor enthusiasts,” said Blake Shelby, Vice President of Sales & Marketing at PSE Archery. 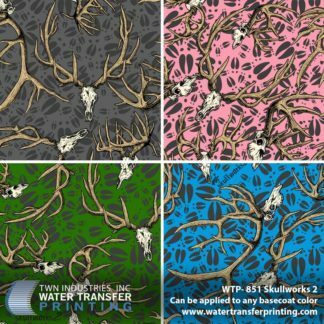 The PSE Skullworks 2 water transfer printing film pattern is available exclusively through TWN Industries, Inc. Call now to place your order and film requirement. The part numbers is: WTP-851. To purchase film, or to find a TWN Certified Decorator who can decorate products for you, call 305-258-9622.